What about Roy and Sam? KCFA starting off 2014 with a BANG! Kona Representative Nicole Lowen and Hawaii County Senator Russell Ruderman—at the request of KCFA and in support of Hawaii’s coffee farmers—will be introducing in the 2014 Legislative session companion versions of a bill to require disclosure on the label of the origin of coffee contained in packages of Hawaiian “coffee blends”. The bill requires a specific listing of the geographic origins of the various Hawaii-grown coffees and the geographic or regional origins of the various coffees not grown in Hawaii that are included in a coffee blend to be listed on the front panel of the label. At the option of the blender, the bill permits the aggregate per wfv cent by weight of the foreign grown coffees to be listed in lieu of a list of each of the geographic origins of the coffees not grown in Hawaii—for example, “90% Foreign-grown coffee; 10% Kona coffee”. This is a very modest step in the direction of fair marketing and consumer disclosure. Visitors from the Mainland who don’t read beyond the large print (for example “Royal Kona” or “Hawaiian Gold Kona Coffee”) at the top of packages of 10% Kona blends will still be misled into buying what they wrongly believe to be Kona coffee. But for those buyers who carefully read the label, for the first time there will be an express indication that 90% of the contents is not from Kona or from any other region of Hawaii. The 8th Annual General Membership Meeting of the Kona Coffee Farmers Association will be held on Sunday, January 12, 2014! Everyone is encouraged to attend this interesting fun time! 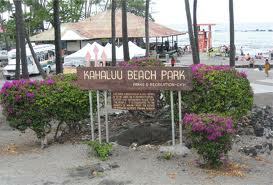 MARK THE DATE now and please come join us at beautiful Kahaluu Beach Park Pavilion. Hear summaries of the KCFA’s year’s activities, cast your vote for 2014-2015 KCFA Board Members, enjoy talking story with your fellow farmers and the Pot luck food contributions will probably be amazing, again. POTLUCK, yes! and the KCFA will supply the beer, eating utensils, plates and cups!! Questions? Email Mary Lou Moss: Marylou@cuppakona.com or call 329-4035. NOTE: You must be a Current paid-up Member of the KCFA to vote. Memberships may be renewed prior to the beginning of the Meeting. In response to that article we got the question: “What about Roy Yamaguchi and Sam Choy?” Both these high-profile Hawaii chefs also tout use of Hawaii grown products and local ingredients–while agreeing to the use of their names on packages of Royal Hawaiian “10% Kona blends”, containing 90% foreign-grown coffee. We believe that renowned Hawaii restaurants and chefs should be featuring genuine Hawaii agricultural products; they should be supporting Hawaii’s farmers; and they should not be assisting the Honolulu blenders in passing off foreign coffee under Hawaii regional names. Memberships – How long do they last? This last spring I realized that every other nonprofit group to which I belong or magazine to which I subscribe starts my membership year on the day I remit my member dues. My membership then ends on my anniversary date. I proposed to the Board of Directors that we change our membership subscription year to end a full year after joining. The board agreed to the change, but made the change effective on December 31, 2013. This means that all of our members who were accustomed to the calendar year system and who renewed in December would notice no change. But it would mean that new members beginning January 2014 would have individual membership expiration dates. An investment has been made to reprogram the website to enable the new automatic renewal system. The new system will save volunteers’ time as well as decrease repeated email campaigns. We hope it will make it easier for you to renew your membership. For our new members who joined before October 2013 their memberships will expire on December 31, 2013. Our new members who joined after September 2013, their membership will expire on December 31, 2014. So for 2013 all members have been treated exactly as all new members since our founding in 2006. We value both our long time members and our new members. We are grateful for all of your support of 100% Kona Coffee and we hope that you will take advantage of your membership privileges and resources. Member suggestions are welcome. We also have been committed to keeping our membership dues at the same affordable rate and we believe that your KCFA membership is a valuable asset. EXPO coming up on January 31 — note new time — 10 a.m. – 4 p.m. You won’t want to miss this one! The EXPO will again be held at Makaeo Pavilion Old Airport, Kailua-Kona. This year we’ve had the most vendors ever sign up to present their products & services to you! Starting at 11:00 a.m., we will start conducting half hour panel discussion sessions with 3 or 4 different experts each covering five different “hot coffee topics”. Lisa Keith of Pacific Basin Agricultural Research Center will be the key note speaker at 2:15 p.m. She will be giving us a Coffee Berry Borer research update among other things. We will be send more information as we get closer to the date, so please stay tuned. For more information, please contact Mary Lou Moss at 329-4035/896-4175. Recently a KCFA member forwarded a link to the State Auditor’s report entitled, “Management Audit of the Department of Agriculture’s Measurement Standards Branch”. The audit had been ordered by the Legislature. The report, issued in March 2013, is candid and it is very critical of the HDOA’s management of responsibilities given by state law to the Measurement Standards Branch. 1—That since 2009 the HDOA has completely failed to meet its statutory responsibility to enforce labeling laws. The Auditor found that from 2009 “all packaging and labeling inspections and price verification testing have been suspended. These activities also include specific packaging and labeling enforcement functions required by law, such as those for island fresh milk, macadamia nuts, and Hawai’i-grown coffee.” ZERO ENFORCEMENT over the course of more than 4 years. This is a low Fat, Diabetes friendly low carb, low sodium recipe. 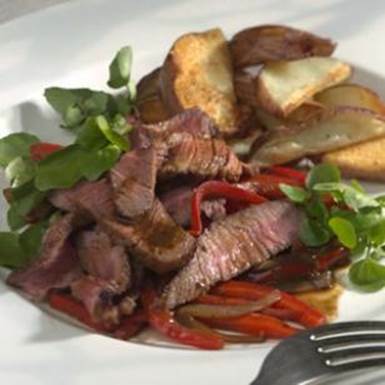 A spice crusted steak with an unusual ingredient of coffee in the sauce that gives it a richness and depth of flavor. 1. Mix cumin, coriander, chili powder, salt and 3/4 teaspoon pepper in a small bowl. Rub steak with the cut garlic. Rub the spice mix all over the steak. 2. Heat 2 teaspoons oil in a large heavy skillet, preferably cast iron, over medium-high heat. Add the steak and cook to desired doneness, 4 to 6 minutes per side for medium-rare. Transfer to a cutting board and let rest. 3. Add remaining 1 teaspoon oil to the skillet. Add bell peppers and onion; cook, stirring often, until softened, about 4 minutes. Add minced garlic and brown sugar; cook, stirring often, for 1 minute. Add coffee, vinegar and any accumulated meat juices; cook for 3 minutes to intensify flavor. Season with pepper. 4. To serve, mound 1 cup watercress on each plate. Top with the sautéed peppers and onion. Slice the steak thinly across the vein and place over vegetables. Top with pan sauce and serve immediately.